High average glycated HbA1c levels during the first two years after type 1 diabetes onset predict higher risk for psychiatric diagnoses. 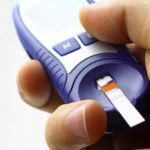 HealthDay News — High average glycated hemoglobin (HbA1c) levels during the first two years after type 1 diabetes onset predict higher risk for psychiatric diagnoses, according to a study published online Sept. 29 in Diabetes Care. Stine M. Sildorf, M.D., from Herlev Hospital in Denmark, and colleagues used data from the Danish Registry of Childhood and Adolescent Diabetes and the National Patient Register to examine whether age at type 1 diabetes onset and average HbA1c levels during the first two years of diabetes onset correlated with the risk for diagnosis with a psychiatric disorder. The researchers found that 1,035 of the 4,725 children and adolescents with type 1 diabetes identified in both registers were diagnosed with at least one psychiatric disorder. Higher risk for psychiatric diagnoses was predicted by high average HbA1c levels during the first two years of diabetes onset. Higher HbA1c levels (0.22 percent) and increased risk for hospitalization with diabetic ketoacidosis (odds ratio, 1.80) were seen for patients with psychiatric comorbidity. “Children and adolescents with type 1 diabetes, and in particular those who fail to reach treatment goals, should be systematically evaluated regarding psychological vulnerabilities,” the authors write.